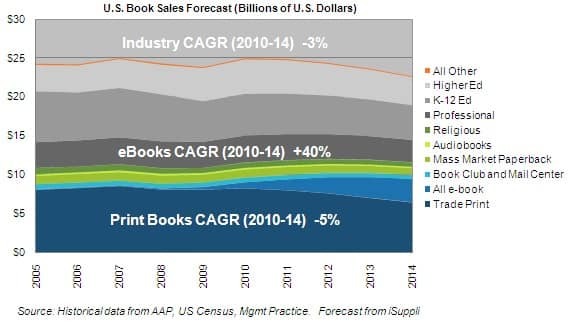 The overall weakening will be spurred by a 5 percent decrease in the CAGR of physical book sales from 2010 to 2014. While e-book sales will soar by 40 percent during the same period, such an increase won’t be sufficient to compensate for the contraction of the larger physical book market. Total book revenue will fall to $22.7 billion in 2014, down from $25.0 billion in 2010. In 2014, e-books will represent 13 percent of total U.S. book publishing revenue, up from 3 percent in 2010 and 6 percent in 2011. However, average selling prices for e-books typically are 40 percent lower than those of paper copies, driving the deterioration in price. These trends are expected to spread throughout the world as non-U.S. sales of e-readers increase. 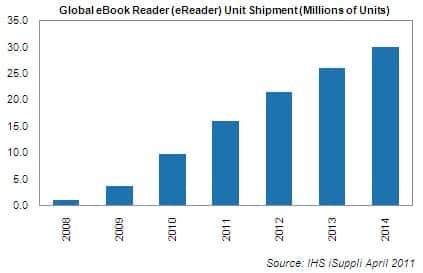 Meanwhile, shipments of e-book readers, also known as e-readers, are expected to more than triple during the period of 2010 to 2014, according to IHS iSuppli research. Global unit shipments of e-book readers will rise to 30 million units in 2014, up from 9.7 million in 2010. The IHS iSuppli forecast is lower than the consensus outlook of 43.4 million units in 2014. Because of competitive and pricing factors, e-book reader shipments are unlikely to achieve some of the more optimistic forecasts. From 2007 to 2009, e-book readers had generated healthy profit margins averaging 35 percent. However, margins collapsed when Apple Inc.’s iPad was introduced in April 2010. To achieve higher profits, e-reader makers must move beyond e-books and offer other items including magazines, enhanced books, and Amazon Singles—or very short books introduced by the online retail giant—as well as games such as Sudoku and Scrabble, and news subscriptions like News Corp’s The Daily, Mather said.